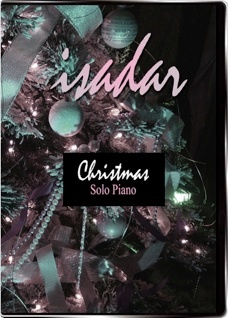 Isadar: Solo Piano, Volume 1 is the first in a series of DVDs that feature live performances and music videos of selections from Isadar’s six (currently) solo piano CDs. Volume 1 is a collection of eleven pieces, two of which are music videos rather than performances. Presented in wide-screen format, the video is clean and crisp and the sound quality is excellent. 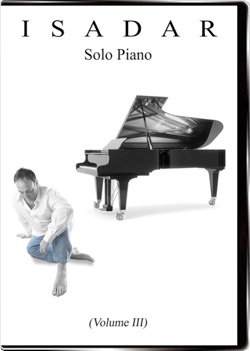 The performances are captured from a variety of angles, offering various views of Isadar’s hands and face as he plays. Some of these angles are shown in montages, keeping the visuals interesting and fresh. I find his playing technique fascinating to watch - it looks so effortless, but I know first-hand that it is not. The music videos are for “Winter,” which shows beautiful footage of snow in a park with and without Isadar walking in it; and “The Bermuda Triangle,” which was filmed at the beach with Isadar in most of the footage. The music covers a variety of moods and playing styles, from very smooth and flowing to rather jazzy - always evocative and deeply felt. My favorite is “Where the Wild Things Are,” and it’s great to be able to watch Isadar’s hands to see how he plays it as well as being able to hear it. This video series is available from Isadar.com. Exceptionally enjoyable!